Apparently, there are real fears of Chinese government enforcing Chinese (and not U.S.) laws to Chinese citizens. Are these fears substantiated? We spent a fair amount of time gathering legal information and trying to access information about the actual iCloud servers and the physical location of encryption keys. While the technical part was quite complicated, we were able to come to certain conclusions. 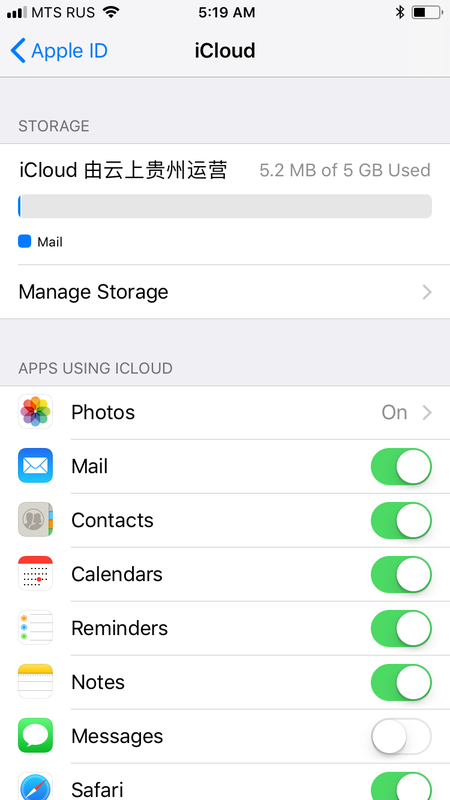 The first thing you need to explore the specifics of a Chinese iCloud account is creating a Chinese iCloud account. This turned to be surprisingly difficult for someone not being physically present in China. Once you create a new Apple ID online at Apple.com, what you get is a so-called “web only” account. At this time, it is not yet pinned to any particular country, and is governed by “common” Apple’s T&C. In order to tie an Apple account to a certain country, you would need to either create an account from an Apple device (iPhone, iPad, iPod Touch or Mac) or use an Apple device to sign in to an existing “web-only” account. This is where the IP address comes into play. Only if you select China as a country during the initial account setup, and only if you make the first login from a Chinese IP address, will the account become “Chinese”. 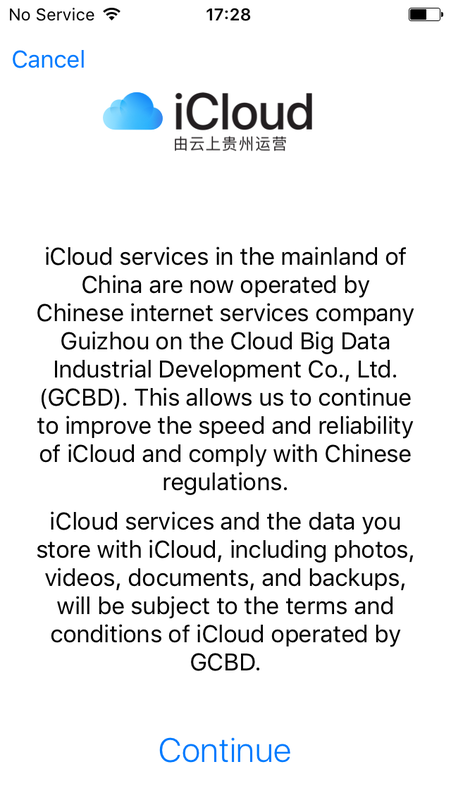 Once the account is tied to China, you receive a message that the data will be stored at GDBD, and the iCloud T&C will be different from those of a non-Chinese account; more on that later. Once we have a Chinese Apple ID set up and running, we could proceed to analyzing the location of iCloud data and, most importantly, the location of encryption keys. iCloud is a highly diversified storage system employing servers run by Amazon, Google and Microsoft among others. iCloud services use sophisticated routing and load balancing, which makes it impossible to trace the real IP address of the physical computer that stores the data and encryption keys. Unfortunately, we were unable to trace any further. All IP addresses also resolve to Cupertino. However, we are unable to traverse Apple’s internal routing, and thus we could not determine the actual (physical) IP address of the computer that keeps the keys. As a result, we cannot use it for tracking location. If you need more technical details on iCloud security, you can start with iCloud Security Overview on Apple web site. No great details are there, though. The publication describes the encryption algorithms and marketing ploy (We take security seriously, otherwise known as We didn’t take it seriously enough). Strictly speaking, iCloud security is sufficient. (By the way, Apple offers a $50,000 bounty for Unauthorized access to iCloud account data on Apple servers.) One thing we are not comfortable with is is the fact that the encryption keys are stored along with the data. Okay, the previous statement is not technically 100% correct; the keys are in fact stored at a different physical location. However, anyone accessing the encrypted data using the proper credentials will also have access to the keys. If you are curious how the data is stored, you are welcome to browse through our presentations from the many security conferences. We were the first to make this discovery, e.g. Cracking and Analyzing Apple iCloud Protocols published back in 2013. Let us compare the Terms and Conditions of Apple services in China and in the U.S.
GCBD is the provider of the Service in the Mainland of China, which permits you to utilize certain Internet services, including storing your personal content […]. When iCloud is enabled, your content will be automatically sent to and stored by GCBD, so you can later access that content or have content wirelessly pushed to your other iCloud-enabled devices or computers. You understand and agree that Apple and GCBD will have access to all data that you store on this service, including the right to share, exchange and disclose all user data, including Content, to and between each other under applicable law. This is where the real differences begin. Apple’s international T&C contain no such statement, not even about Apple! Is this conspiracy? In reality, Apple has physical access to iCloud data, and it serves the data to law enforcement when presented a legal warrant. This is made possible by the fact that Apple encrypts iCloud data with cryptographic keys that are retained by Apple and stored on Apple servers, according to both iCloud security overview and our own findings. We know this for sure since we performed a comprehensive analysis of iCloud data protection and built a tool for downloading (and decrypting!) data from iCloud accounts. To terminate your Account and delete your Apple ID, contact Apple Support at https://support.apple.com/contact. All requests from government and law enforcement agencies outside of the United States for content stored in our data centers in the United States, with the exception of emergency circumstances (defined above in Emergency Requests), must comply with the United States Electronic Communications Privacy Act (ECPA). A request under a Mutual Legal Assistance Treaty or Agreement with the United States is in compliance with ECPA. Apple Inc. will provide subscriber content, as it exists in the subscriber’s account, only in response to such legally valid process. The Apple differential privacy implementation incorporates the concept of a perdonation privacy budget (quantified by the parameter epsilon), and sets a strict limit on the number of contributions from a user in order to preserve their privacy. The reason is that the slightly-biased noise used in differential privacy tends to average out over a large numbers of contributions. Let us know if you understand what that actually means! Apple is doing everything it can to comply with the new Chinese regulations. The Chinese government already performed an exemplary execution, completely banning Google services in mainland China. As a result, Google is not just losing humongous amounts of money, but got the big headache of incompatible Android smartphones devoid of Google certification and Google services. Obviously, Apple won’t go the way of Google. First VPN apps, then iCloud encryption keys. What’s next in line? This entry was posted on Tuesday, April 10th, 2018 at 7:18 pm	and is filed under Did you know that...?, General, Industry News, Security. You can follow any responses to this entry through the RSS 2.0 feed. Both comments and pings are currently closed.